While searching for a tree trimming company, you might like to take into account Totally Trees to get your home looking better than ever before. 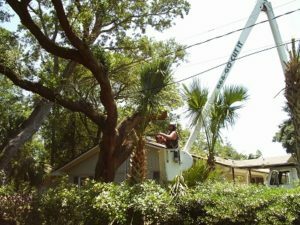 The tree trimming procedure can be quite challenging and may even call for a skilled professional to help map out a good and no damaging approach. Totally Trees has been servicing Michigan and Florida locations over the past 10 years with top quality service and the best deals. Create a landscaped clearing to your house or simply have some challenging areas, which can be hazardous, taken out. Rot or decayed branches and trees can become a serious safety threat. This can create a real danger for your family and property, or home. Taking away these basic safety worries, will provide you with piece of mind. The Pensacola tree trimming method is fairly straightforward to get going with. First, you want to make sure you identify the problematic areas that are of concern to you. Your next action would be to give Totally Trees a call for your free estimate. Once your appointment day comes. You can then receive your tree trimming estimate to look over the costs that are associated. The single thing that may be remaining to accomplish is determine what work you would like to have done and prepare your Pensacola home for the work to be done. Branch tree trimming clients recognize that in relation to sustaining their property safe and beautiful for years to come, to contact the knowledgeable professionals at Totally Trees. We can assist you with your tree trimming process from beginning to end. We are among the finest tree trimming businesses in Florida and Michigan. Have your home looking fantastic by eliminating your decayed, overgrown, or unpleasant trees. In Ludington, our customers know that keeping their property safe and enjoyable is top priority. For over a decade Totally trees has helped Ludington tree trimming customers with 100% satisfaction rating. Have your property looking great and increase value by cleaning up your trees. If you are looking for tree trimming near Ludington, give us a call today for your free tree estimate! We love providing great service to our Manistee customers, and all customers we service. Tree trimming can be a difficult and dangerous project, that should be handled by professionals. Bring beauty and value back to your property with the experts at Totally Trees. Make your Manistee home or property shine by having one of our tree trimming experts give you a free estimate!